A terrific display from St Johnstone put Hibernian to the sword in a dramatic encounter at McDiarmid Park. Goals from Liam Craig and Cillian Sheridan put Saints into a commanding lead within the first 10 minutes. Kenny Deuchar's header increased the home side's lead before Anthony Stokes pulled a goal back for Hibs. Sheridan grabbed a second after Hibs' Colin Nish had been sent off and Craig's penalty rounded off an impressive night for the hosts. St Johnstone welcomed back local boy, midfielder Kevin Moon, but lost Filipe Morais and Peter MacDonald to injury. Hibernian, meanwhile, were without midfielder Kevin McBride after he picked up a hamstring injury against Rangers on Sunday. St Johnstone had the best of the early exchanges and it was no surprise when Craig opened the scoring with a fine left-footed drive, which flew past Graeme Smith in the Hibs goal. Saints had their tails up and on-loan Celtic striker Sheridan flicked the ball past Smith from a pinpoint cross by Murray Davidson to claim his first goal for the Perth club - the 18th player to score for Saints this season. Smith then had to look lively as Deuchar volleyed the ball from the edge of the box, only to see the former Rangers goalkeeper tip the ball wide for a corner as the home side dominated. It continued to be one-way traffic as the first half wore on with the Hibernian defence struggling to cope with the Saints front pair of Deuchar and Sheridan. Sol Bamba put his keeper under pressure with a poor header back towards goal, but the Hibernian number one managed to smother the danger before Sheridan could pounce. Hibs finally began to show some attacking intent as the half drew to a close, but their strikers couldn't find a way past the impressive-looking Michael Duberry and Graham Gartland in the Saints defence. St Johnstone began the second half in the same attacking vein as they had the first, Moon blazing an effort wide. Craig was then presented with a great chance to put the match beyond Hibs, but shot straight at Smith when one-on-one with the keeper. Derek Riordan had a rare glimpse of goal for Hibs, but blazed high and wide from the edge of the box. Out of nowhere, Stokes deflected a header off Gartland into the net, but the assistant referee ruled the effort out for offside. Just as it seemed Hibs could stage a fightback, Deuchar scored a third for Saints with a back- post header from Sheridan's cross. However, Stokes handed Hibs a lifeline with a neat right-footed finish to claim his 16th goal of the season. The game then took another twist as substitute Nish was shown a straight red card for kicking out at Duberry. Saints took instant advantage as Sheridan lashed the ball home from close range following gritty build-up play from Deuchar. Hibernian manager John Hughes then saw himself ordered to the stand for protesting at Nish's sending off. Bamba capped a dismal night for his side when he handled the ball in the box, Craig's penalty deflecting off the unlucky Smith and into the back of the net. 90:00+2:57 The match has reached full-time. 90:00+2:16 Inswinging corner taken left-footed by Liam Craig from the right by-line, clearance by Souleymane Bamba. 90:00+1:36 Liam Craig takes the inswinging corner, clearance made by Ian Murray. 89:04 Chris Millar concedes a free kick for a foul on John Rankin. Direct free kick taken by Ian Murray. 87:53 Unfair challenge on David MacKay by Derek Riordan results in a free kick. Liam Craig crosses the ball in from the free kick, save by Graeme Smith. 87:07 Inswinging corner taken by Liam Craig from the right by-line, clearance made by Souleymane Bamba. 85:56 Substitution Collin Samuel replaces Murray Davidson. 84:01 Substitution Gavin Swankie is brought on as a substitute for Kenny Deuchar. 82:59 David Wotherspoon takes a shot. Graeme Smith makes a comfortable save. 80:47 Derek Riordan is ruled offside. Graeme Smith takes the indirect free kick. 78:55 GOAL - Liam Craig:St Johnstone 5 - 1 Hibernian Liam Craig scores a placed penalty. 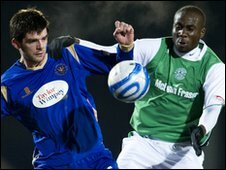 St Johnstone 5-1 Hibernian. 77:10 Corner from right by-line taken by Liam Craig. Handball by Souleymane Bamba. 75:53 Free kick awarded for an unfair challenge on John Rankin by Kenny Deuchar. Graeme Smith restarts play with the free kick. 75:06 Substitution (St Johnstone) makes a substitution, with Steven Milne coming on for Cillian Sheridan. 74:12 The referee blows for offside against Kenny Deuchar. Free kick taken by Graeme Smith. 73:04 Kenny Deuchar is ruled offside. Graeme Smith takes the free kick. 70:02 Kenny Deuchar provided the assist for the goal. 70:02 GOAL - Cillian Sheridan:St Johnstone 4 - 1 Hibernian Cillian Sheridan fires in a goal from inside the penalty box high into the middle of the goal. St Johnstone 4-1 Hibernian. 69:13 Sent off The referee shows Colin Nish a red card for foul and abusive language. 66:35 John Rankin provided the assist for the goal. 66:35 GOAL - Anthony Stokes:St Johnstone 3 - 1 Hibernian Anthony Stokes fires in a goal from inside the six-yard box low into the middle of the goal. St Johnstone 3-1 Hibernian. 64:25 Unfair challenge on Kenny Deuchar by Paul Hanlon results in a free kick. Direct free kick taken by Liam Craig. 62:00 The assist for the goal came from Cillian Sheridan. 62:00 GOAL - Kenny Deuchar:St Johnstone 3 - 0 Hibernian Kenny Deuchar scores a headed goal from close in. St Johnstone 3-0 Hibernian. 61:19 Unfair challenge on Souleymane Bamba by Cillian Sheridan results in a free kick. Graeme Smith restarts play with the free kick. 59:21 Colin Nish challenges Chris Millar unfairly and gives away a free kick. Free kick taken by Graeme Smith. 58:24 Free kick taken by Graeme Smith. 58:24 Substitution (Hibernian) makes a substitution, with David Wotherspoon coming on for Merouane Zemmama. 58:24 Cillian Sheridan concedes a free kick for a foul on John Rankin. 56:35 The free kick is swung in right-footed by Merouane Zemmama, David MacKay manages to make a clearance. 56:35 Substitution Abdessalam Benjelloun leaves the field to be replaced by Colin Nish. 56:35 Booking Steven Anderson shown a yellow card. 56:31 Steven Anderson challenges Chris Hogg unfairly and gives away a free kick. 55:47 The assistant referee signals for offside against Anthony Stokes. Graeme Smith restarts play with the free kick. 53:51 Corner taken by Liam Craig, Michael Duberry takes a shot. Comfortable save by Graeme Smith. 52:49 Foul by Abdessalam Benjelloun on David MacKay, free kick awarded. Direct free kick taken by David MacKay. 52:21 The assistant referee flags for offside against Anthony Stokes. Direct free kick taken by Graeme Smith. 51:51 Cillian Sheridan takes a shot. Save by Graeme Smith. 50:31 Steven Anderson challenges Merouane Zemmama unfairly and gives away a free kick. Cross/shot by Derek Riordan. 49:25 Liam Craig takes a shot. Save made by Graeme Smith. 46:40 Unfair challenge on Cillian Sheridan by Paul Hanlon results in a free kick. Liam Craig takes the direct free kick. 46:02 Shot from just outside the box by Kevin Moon misses to the right of the goal. 45:14 Liam Craig takes the inswinging corner, John Rankin manages to make a clearance. 45:00+0:50 The whistle is blown to end the first half. 44:32 Free kick awarded for an unfair challenge on Kenny Deuchar by Ian Murray. Chris Millar takes the free kick. 44:08 Derek Riordan is flagged offside by the assistant referee. Free kick taken by Graeme Smith. 42:29 Corner taken right-footed by Merouane Zemmama, clearance by Cillian Sheridan. 40:01 Foul by Chris Millar on John Rankin, free kick awarded. The free kick is swung in right-footed by Derek Riordan, clearance by Graham Gartland. 38:59 Kenny Deuchar fouled by Merouane Zemmama, the ref awards a free kick. Liam Craig takes the direct free kick. 35:48 Kevin Moon concedes a free kick for a foul on Abdessalam Benjelloun. Paul Hanlon restarts play with the free kick. 35:20 Anthony Stokes is flagged offside by the assistant referee. Direct free kick taken by Graeme Smith. 34:45 Cillian Sheridan takes a shot. Comfortable save by Graeme Smith. 32:18 Corner taken by Liam Craig, Graeme Smith makes a save. 31:21 Free kick awarded for an unfair challenge on Kenny Deuchar by Chris Hogg. Direct free kick taken by Graham Gartland. 29:24 Inswinging corner taken by Liam Craig from the right by-line, Graham Gartland has a headed effort at goal from close range which goes wide of the left-hand post. 28:35 Chris Millar fouled by Abdessalam Benjelloun, the ref awards a free kick. Michael Duberry takes the direct free kick. 27:34 Anthony Stokes is ruled offside. Free kick taken by Graeme Smith. 26:03 Corner taken by Liam Craig, free kick awarded for an unfair challenge on Paul Hanlon by Graham Gartland. Free kick taken by Graeme Smith. 20:15 Inswinging corner taken by Derek Riordan from the left by-line, save made by Graeme Smith. 19:04 Chris Millar has an effort at goal from outside the penalty box which goes wide left of the goal. 17:57 Foul by John Rankin on Kevin Moon, free kick awarded. Direct free kick taken by Graeme Smith. 15:15 Cillian Sheridan is flagged offside by the assistant referee. Free kick taken by Graeme Smith. 13:34 Corner taken by Liam Craig played to the near post, save by Graeme Smith. Unfair challenge on Graeme Smith by Graham Gartland results in a free kick. Direct free kick taken by Graeme Smith. 13:15 Kenny Deuchar takes the chance to get an effort at goal. Save by Graeme Smith. 12:35 Murray Davidson produces a right-footed shot from outside the box and misses left. 9:27 Assist by Murray Davidson. 9:27 GOAL - Cillian Sheridan:St Johnstone 2 - 0 Hibernian Goal scored by Cillian Sheridan from close in to the bottom right corner of the goal. St Johnstone 2-0 Hibernian. 8:56 Unfair challenge on Anthony Stokes by Michael Duberry results in a free kick. Derek Riordan takes the free kick. 7:04 Liam Craig takes a inswinging corner to the near post, John Rankin makes a clearance. 6:32 The referee blows for offside. Direct free kick taken by Graeme Smith. 4:05 Assist by Cillian Sheridan. 4:05 GOAL - Liam Craig:St Johnstone 1 - 0 Hibernian Liam Craig fires in a goal from outside the penalty box to the bottom right corner of the goal. St Johnstone 1-0 Hibernian. 1:55 David MacKay takes a shot. Graeme Smith makes a save. 1:10 Foul by Paul Hanlon on Liam Craig, free kick awarded. The free kick is swung in left-footed by Liam Craig, John Rankin manages to make a clearance. 0:42 Unfair challenge on Abdessalam Benjelloun by Kevin Moon results in a free kick. John Rankin takes the free kick.